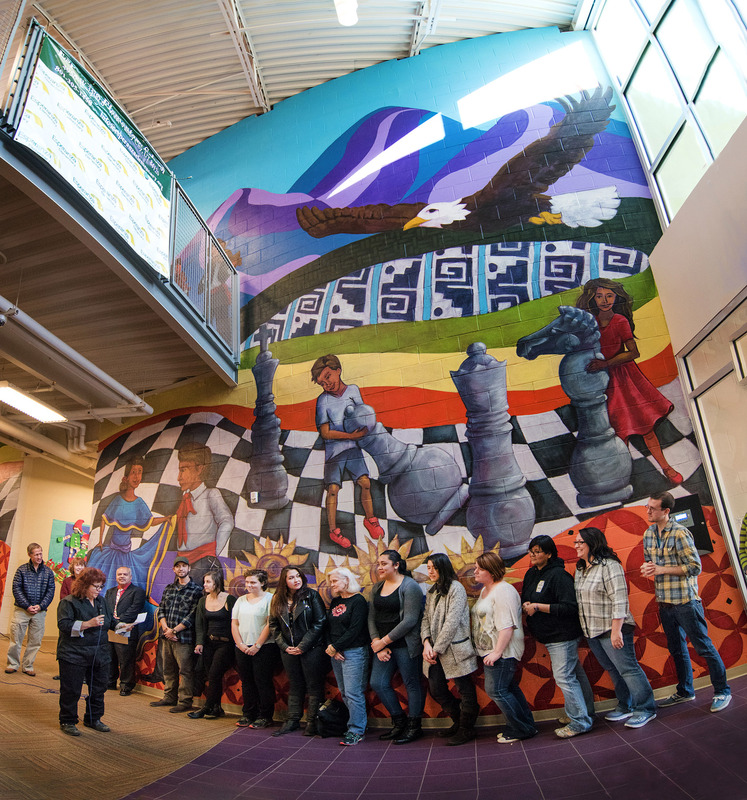 A massive and meaningful mural created and painted by University of Utah Professor V. Kim Martinez and 11 of her art students was unveiled Dec. 11 at Esperanza Elementary in West Valley City. Martinez emphasizes that she is making art to create social justice. 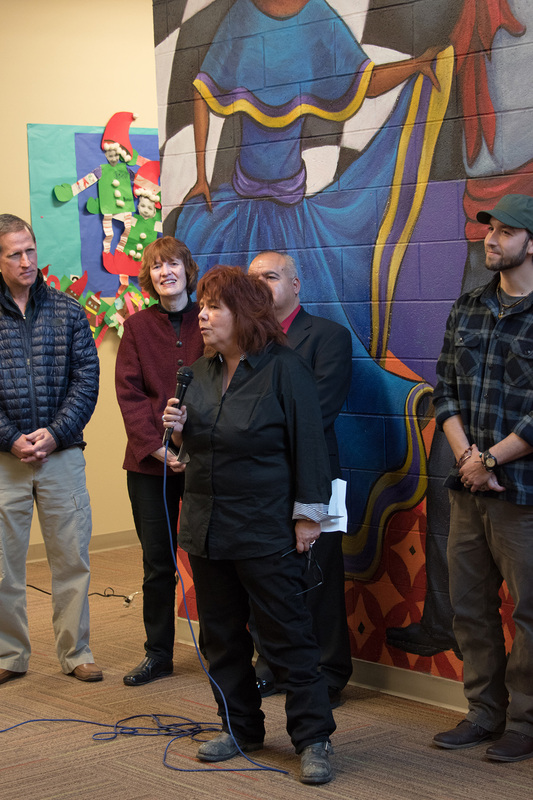 “Muralism,” says Martinez “can be something that is timely and will last between five to 15 years. I am trying to teach [my students] that they can change the world through art. 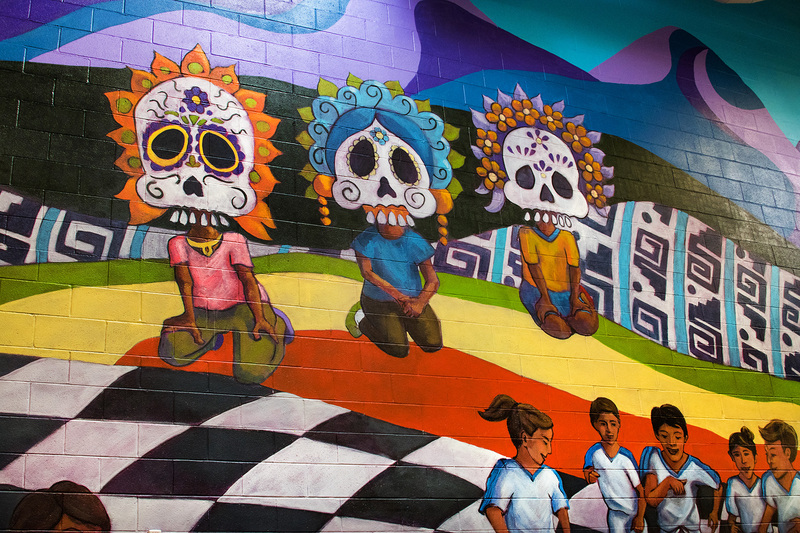 Some of these kids had painted murals before, but mostly with spray paint,” she adds with a laugh. She also is trying to bring in the traditional Mexican muralist art she studied with UCLA Professor Judy Baca – famed for the “Great Wall of Los Angeles.” Baca was greatly influenced by David Alfaro Siqueiros who, with Diego Rivera and Jose Clemente Orozco (the Three Greats) established the Mexican Mural Movement starting in the 1920s. Baca traveled to Mexico to study at Siqueiros’ studio with others who passed down what they had learned from him before he died in 1974. This she passed along to Martinez. As she does so well, Ann Poore has given a first rate picture of V Kim Martinez, the community leader, public artist, and effective head of Salt Lake’s mural movement. Lucky indeed are the students who come under her guidance early in their careers as artists: they stand to make a difference. Seeing her in this context, I was reminded of my first, unforgettable encounter with Martinez. I, too, was fortunate in that my introduction to her involved some of her strikingly original, personal art works, which are not more important than her community efforts, but are necessarily more representative of her unique sensibility. So with a nod to Ann and her work filling out the incomplete portrait that I drew years ago, I’d like to recall my first world-changing experience with V Kim Martinez.